The MOBI 500 is the ideal solution to bind books and calendars from min. 50 mm to max. 500 mm working width. Skip-bindings are possible. The touch-screen control panel is very user-friendly, and, therefore, provides rapid format changes. The machine is completely equipped for processing 13 diameters from 3/16″ to 1 1/4″ (0,5 to 32,0 mm). Each diameter requires a guide plate. The guide plates can be changed easily within seconds. 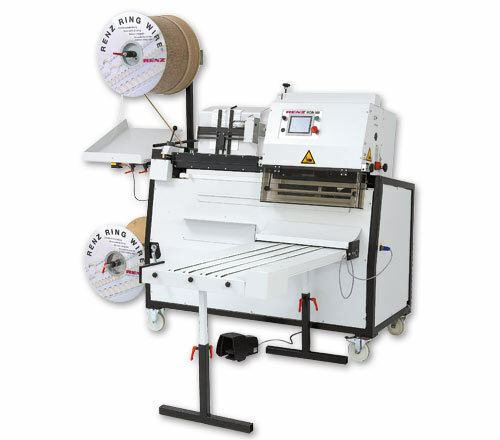 Manually hanging the prepunched product in the binding element is easy. A foot-switch activates the transport to the binding station. After binding the product is out-fed either to the standard height-adjustable cover box or to the optional height-adjustable and continuously-running shingle conveyor with adjustable overlap setting. If necessary the required spare parts are immediately available on-site. With the help of a spare parts package down-times can be reduced to a minimum. subject to diameter and length wire.